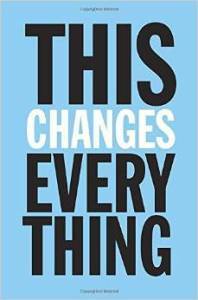 This Changes Everything by Naomi Klein is not just one more of many books on environmental issues. It is a remarkable narrative that tells us an all-encompassing story of how humans have created a crisis that threatens their own survival. It also offers solutions available to us provided we have the will to act. She skillfully weaves together the political, social, cultural, and scientific fabrics that have brought us to the brink of environmental and economic collapse, yet still leaves us with hope for the future. Naomi Klein explains how endless economic growth and the corporate quest for wealth are undermining efforts to alleviate poverty and build a sustainable future. She describes how our current political and economic model is at war with life on earth and has created a non-negotiable conflict between the indiscriminate onslaught on earth’s resources and the never-ending attempts to protect the only planet we have. She is adamant about the absolute necessity of escaping from the grip of privatized energy to the public ownership of our resources. She brings into play the vital role of indigenous people, valiantly fighting to maintain both their culture and their livelihood. She describes some of the significant changes that will be required to rescue civilization as we know it and that we must find a strong moral voice that reaches beyond greed and selfishness. How does Naomi Klein believe these changes will occur? Not by government leadership. Not by the emergence of some heroic figure. If it happens at all, it will be by us, all of us, in a mass social movement.